Hi everyone, Deanna here today back with a Halloween card for you today. Now you may be wondering what would you do with a Halloween card if you don't normally send Halloween card.. These cards make great birthday cards for someone with a birthday near Halloween. You can send it as a thank you card, or to a friend to let them know you are thinking of them and to cheer them up. Here is what I came up with for you today. I started my card by die cutting a tag from the Poppy Stamps Main Street Tags die set. Next I grabbed a Tim Holtz stencil in the shape of a spider web and using Hickory Smoke distress ink and a round blending tool, stenciled my spiderweb onto the tag. I used my Crop-i-dile to punch a whole in the top of my tag and added some ribbon to the tag. Once I had the tag done, I put together my card base. I started with a dark gray card stock cut and folded to make a 4 1/4" X 5 1/2" card base. 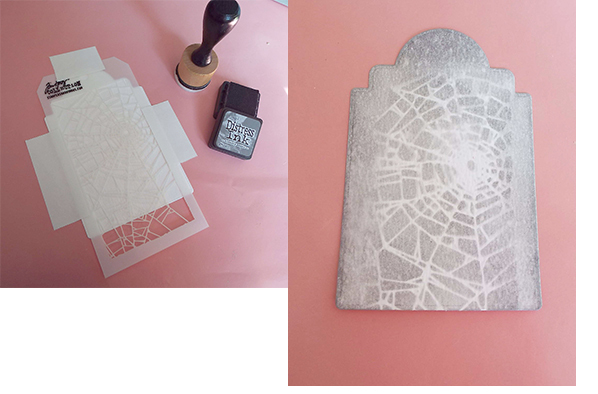 I added a light gray mat and then a patterned paper mat. 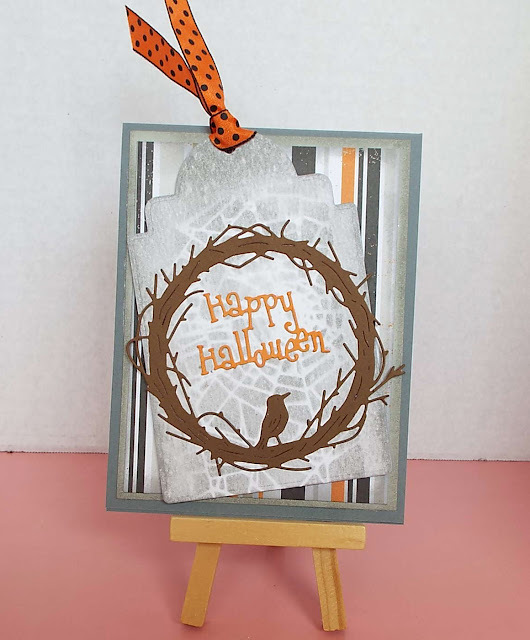 Next I die cut my Halloween wreath our of brown card stock and the Happy Halloween sentiment out of orange card stock using the Cheery Lynn Happy Halloween Twiggy Wreath die. Super card with great stencilling! What a cute card Deanna! Super cute card Deanna! I rarely stencil ... thanks for inspiration! I had not seen that wreath before; really like it and the word die with it. Like the background paper you used and your stenciling. Great card to get you in the mood for Halloween. Cute design, Deanna, and so clever to use the stencil in the background on the tag! wonderful design! Love the web stenciled on the tag, great background for your bird on the wreath, fun papers! !